We seek to foster spiritual development by providing training to pastors throughout the remote villages of Haiti. While pastors have a heart to serve their community, they often feel ill-equipped to do so without any formal training. HFHF partners with churches and church leaders throughout the United States to come alongside pastors in Haiti and provide training, support, and encouragement. 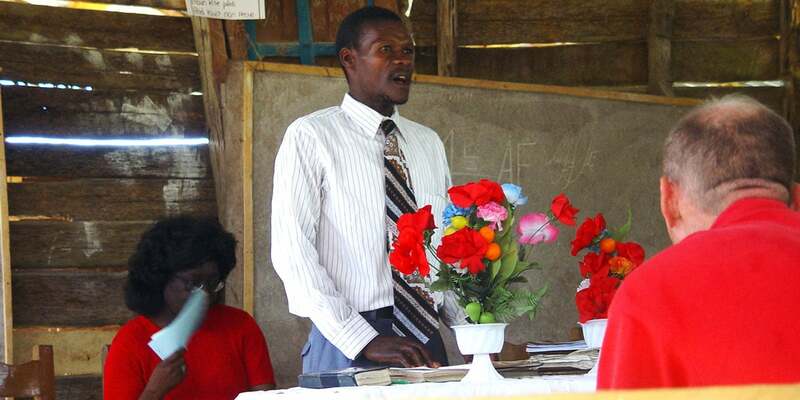 Currently, HFHF partners with churches throughout Zorangé, including one church plant. Pastor conferences are conducted annually for churches across Bainet providing training for pastors, children’s ministry, and worship music. Sermons are broadcast throughout Bainet over Radio Bigot. Our vision is a Bible Training School in rural Haiti, where pastors and missionaries can receive education and become equipped as leaders. Our vision is for young people from the community to be moved to serve the people in the community and make disciples to carry out the great commission: “Therefore go and make disciples of all nations, baptizing them in the name of the Father, the Son and the Holy Spirit and teaching them to obey everything I have commanded you. And surely I am with you always, to the very end of the age” Mat 28:19-20. Today our local church in Zorange has a thriving women’s and youth ministries. It is our prayer to find dedicated and trained brothers and sisters to help kick off a children’s ministry as well. We have several activities throughout the year that the community, our church partners look forward to. They are our annual youth conference which begins on Thursday during the holy week and ends on Easter Sunday! The women’s conference that takes place in May and bible conference takes place in July! Leadership development: we have a few dedicated church members that make the trek every weekend to Port-au-Prince from Zorange to attend bible school! We know investing in the local people gives us continuity and ownership and sustainability. With 50 percent illiteracy in Haiti, daily sermons and Bible readings over Radio Bigot are important for the community to access the Bible. Hope for Haiti Foundation provides “Bibles on tape” that have the New Testament recorded in Creole for those who cannot read. Want to get involved? Are you interested in supporting a church in Haiti? You can provide a pastor’s salary, training opportunities, and basic supplies for a church for $1,000 a month. Donate online or contact Jean Eloi for more information. Would you like to be involved with a pastor training conference? Join us on our next trip.